Link back to main page. + Shears can now pick up long grass, ferns, and dead bushes. > Another MASSIVE rewrite to ores, caves, and tools. Goodness gracious. + Added rare, glowing Blue Mushrooms. + Added new background music by Fiasco (evanfiasco). + Added a new structure generator into the game. This included rare surface buildings and new dungeons. > Changed effectiveness of a lot of blocks so then axes are now effective on things like workbenches. > Removed zombies dropping boron, now they just drop leather tunics or pants. > Stone was made softer, logs were made harder. > Changed the dungeon loot to be more valuable. > Temporarily made the grass always render as "fancy"
> Bug fixes of course, but most notably a fix for AMD graphics cards for Beta and the infamous inventory lag bug. 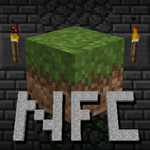 - Removed "hot ingots" and "refined iron"
** Notice this is not "Beta 1.8.x" anymore, this is the first official version of NFC. > A LARGE rewrite to ores, caves, and some of the tool's abilities. + Added Secret Disc "Mountain's Bounty"
** Long and painful updates with testing the game over and over, trying to make a balanced ore system that was decently hard. This was rather futile as I totally redid it again in 1.8.5 without having it be "hard". + Added 5 new secret music discs! ** There is quite a story behind this update, perhaps I'll get into that on a page later. + ADDED OLD SOUNDS BACK WOOOO!! + Added new background track "Voice of the Spirit"
blocks, armor, ways to find ores, etc. ** This may have been a big update and breakthrough for early NFC, but man did I make it a grind to progress. We'll see how that affects things later. ** I believe this was bug fixes, but I honestly have no idea what this was. ** This was an update preparing for adding in all of the new ores as I was testing what it was like to have the ore in giant veins instead of finding a bunch of small ones.